Letters from a Storage Locker #17 - "Okay, lover?" "Letters from Storage Lockers" are always some of our most popular blogs- people just love reading letters or journals of other people. It's hard to explain why. Maybe it's because people can feel as if they are a part of a secret, maybe it's just a nosy characteristic that lurks deep inside of all of us, maybe it's a secret longing to identify with others or feel as if we're not really alone. Whatever the reason, we are always constantly looking out for these letters in lockers in order to share them with you, and we constantly receive feedback on how these tidbits of other people's lives have made your days infinitely better. 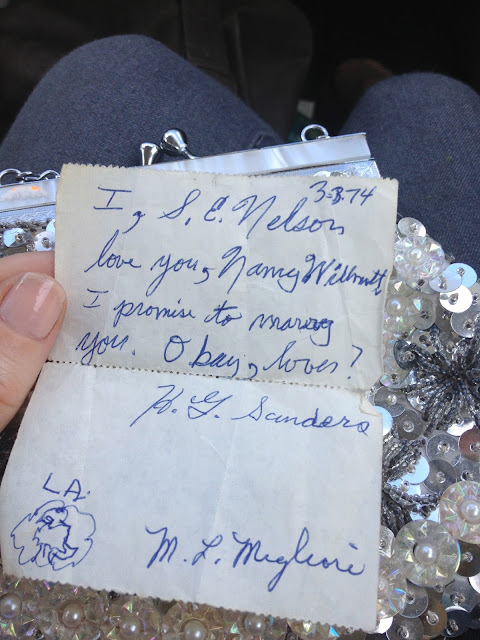 In our search for stories we have looked for letters in storage units, thrift stores, garage sales, and estates as well-- but I wanted to share with you something that happened to me today that just reaffirmed the idea that stories are everywhere. I found a letter today by accident, and not just any letter, but a vintage one. Super score, right? I must have found it while digging a storage unit, correct? Wrong! You see, we live in New Orleans, home of the greatest Mardi Gras celebration anywhere, and just last year I had the ridiculously good fortune of having a friend invite me to become a founding member of the Mystic Krewe of Nyx. 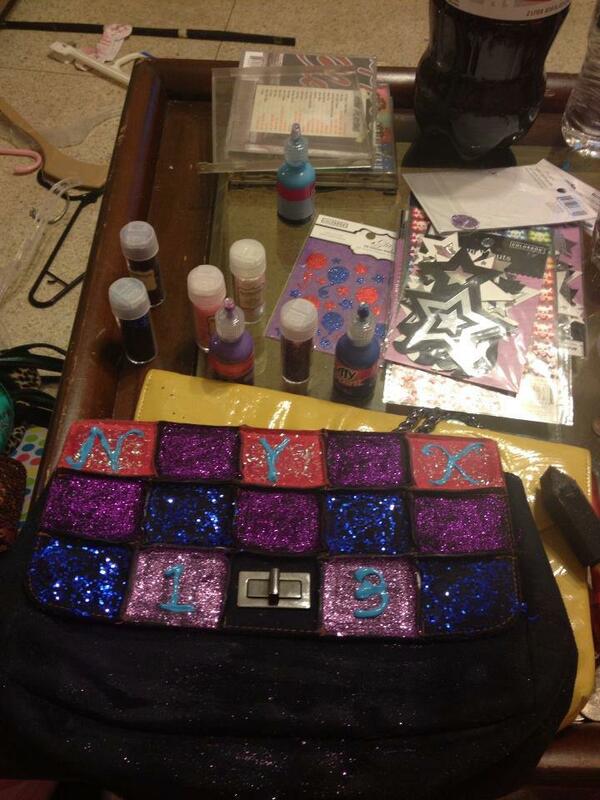 Named for Nyx, Goddess of the Night, Mystic Krewe of Nyx is an all female krewe of (now) almost 1,000 members. 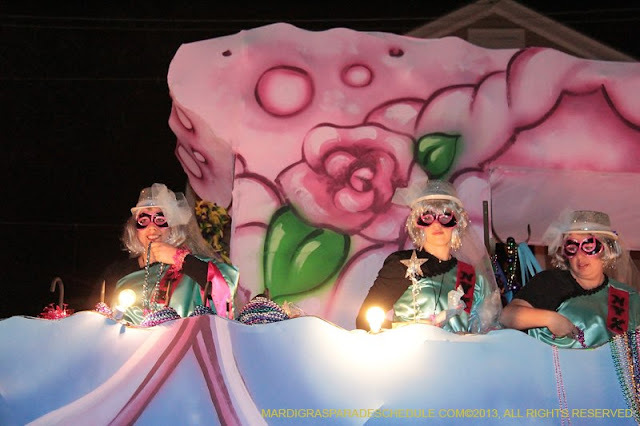 The Nyx goddesses ride through the streets of New Orleans on beautifully decorated floats, following a theme which has ranged from anything from "NOLA Reality TV Reigns" to this year's "What A Girl Wants". Here's a shot of me and Nyx sisters of mine on our float this year, "The Princess Bride." I'm getting to the point, I promise. 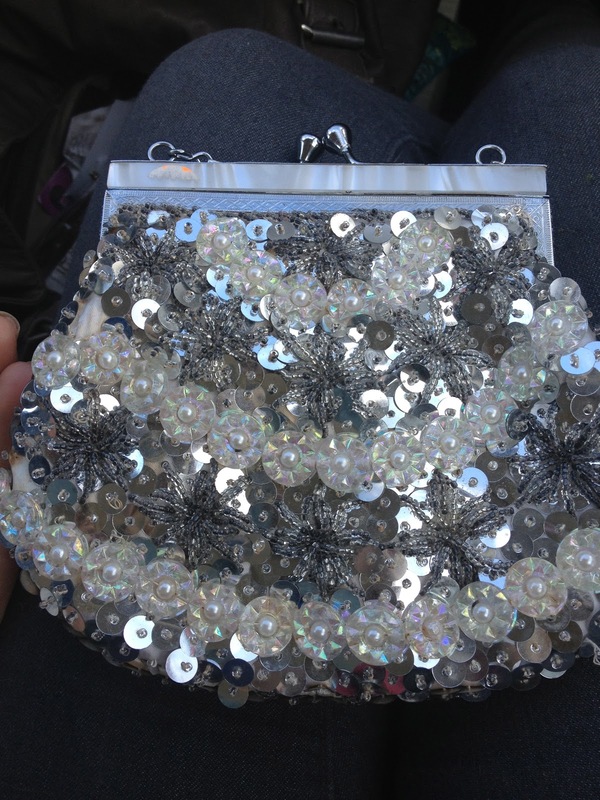 I find hundreds of purses each year in Storage units, and share those with my float sisters and other Krewe members for either free or something like $1, and occasionally, they return the favor by finding purses that they think that I would like. 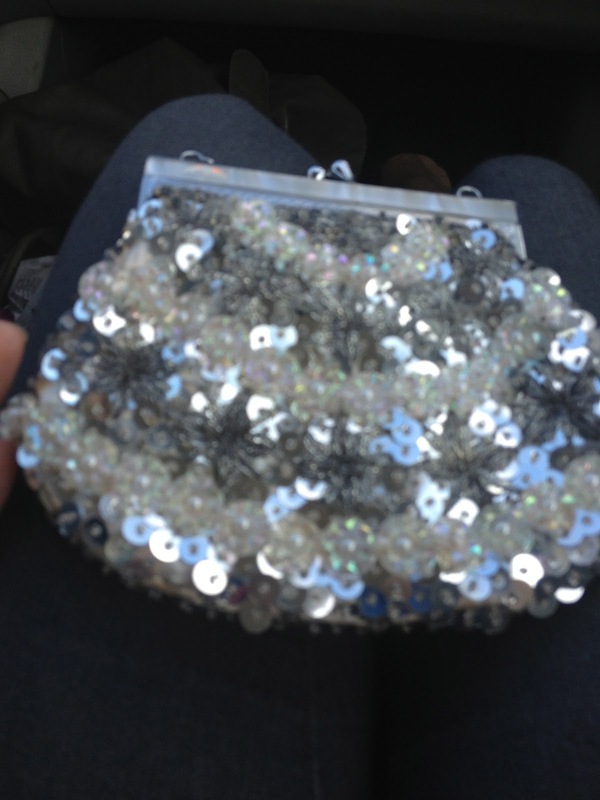 This particular purse (below) is one that I've had for months. I honestly am not sure whether it was from a storage unit, garage sale, thrift store, from a family member, or from a Nyx sister, but I can tell you that I came back across it recently at a garage sale we had, and I actually loved the purse so much that I decided to use it for a year as a clutch and then decorate it for next year, 2014. It's beautiful, and vintage, the interior lining dates it at LEAST 30 years if not more, and it's definitely a beautiful sight to behold. So, the other night, when I was working an Oscar Night viewing party for a friend, and needed a glitzy glamorous bag to go with my red carpet outfit, I ran and thought of this bag last minute. I threw in my lipstick, mascara, some cash and my ID, and was out the door. I opened and closed the bag all night and although I saw a small piece of paper, I thought it was just the inside of the lining, something common with bags from that date. It was yellowed just enough so that it matched the lining perfectly. Flash forward to today. My little glamorous mini bag is inside my real purse (Who doesn't put a bag inside of a bag every now and again, girls?) - and Brian and I are crossing the Crescent City Connection, returning from an estate we had worked on all day. The connection is a toll bridge, and I needed a dollar. Going through my real purse and finding nothing smaller than a $20, I open the clutch to see what's inside, dig my fingers deep inside the pockets looking for change, and find that little scrap of paper, which I now realize has writing on it. Voila! I thought maybe it would be a receipt or something, never in my wildest dreams could I have imagined it would be a marriage proposal. 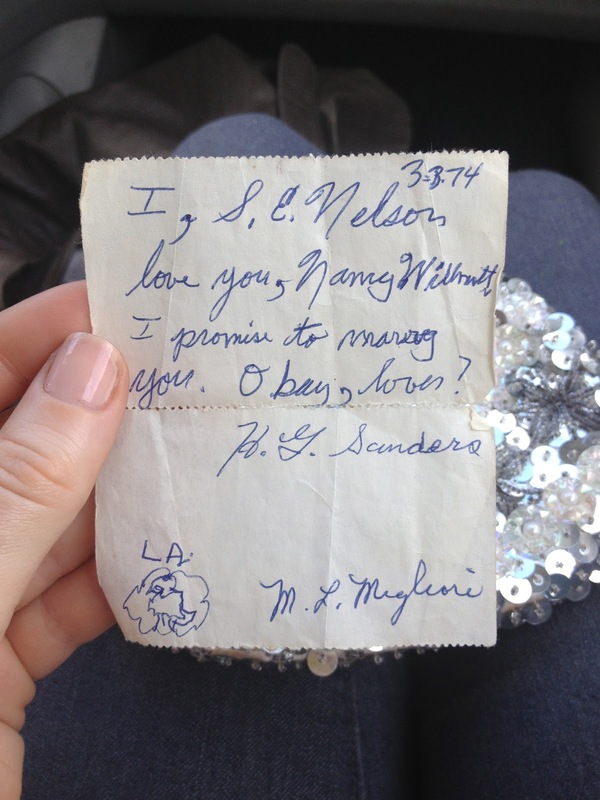 Dated 3-3-1974, this love letter reads "I, S.E. Nelson, love you, Nancy Wilhutt. I promise to marry you. Okay, lover?" It then has two other names written, H. G Sanders, and M. L . Migliore, although I"m not sure of their meaning. A friend suggested that they may have been witnesses and the drawing underneath the LA could be perceived as a seal making it "official." Either way it's one of the sweetest things I've ever read, and I wasn't even looking for it. The moral of the story? Keep your eyes open, stories are everywhere. Hopefully, you'll return the favor, and share them with us- but even if you don't, hopefully you'll share them with someone and keep the memories alive. Possessions are just things, we illustrate that point to our clients all of the time-- but it's the memories, and the things with the sentimental value, that are our most cherished possessions and that remind us most of the people we love. Have a great week, everyone-- keep your eyes and hearts open!